Yay! I finally figured out a way to ply that I’m happy with, so may have to pick up some top, now that I know I can make it into something useable. Glad to hear the wheel went to a good home. How many wheels is that now? And I know who has her too! I almost got weepy passing Alice onto the next new spinner on Saturday. Enjoy your new wheel when it arrives. I BARELY got one of the yarns I wanted….grrl stuff went quickly! Very very quickly. I did get one of these treasure skeins but I was desperate for one of the dragon’s blood ones. Don’t know what happened but they never showed up on my screen. Happy with what I got though. I was being a dork and forgot about the update!! Grrr. Next time, I guess. Wow! You are getting too popular, I used to be able to shop at a leisurely pace and not worry if I didn’t hit the update right at 2pm. Now I am spurred on to frantic refreshing and purchasing to at least get something. 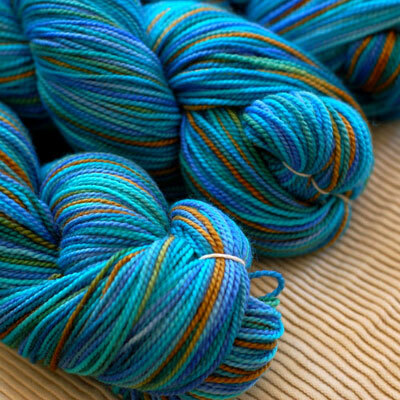 Sock yarn devotes are a crazed bunch :) Congrats on your success!! If I didn’t spin my bedroom no spinning would get done – plus it keeps the wheel away from the kids. Darn it I totally forgot about the update. Do you still send emails? – I don’t think I have gotten one in a while. Loopykd, I am so sorry! But I snagged the Dragons Blood! I am quick on the draw, and I apologize! Oh yeah, sure you are! How many did you buy? Can I buy just one from you? There was only one, Loopykd. I’m not sure what I’m going to use it for, but I couldn’t resist those colors. Ooh. Checked out your Flickr photos and I must say…those color names really float my boat for some reason. Ha! Congrats on the quick sell!